Share pictures of your racks and pedalboards featuring Voodoo Lab products. 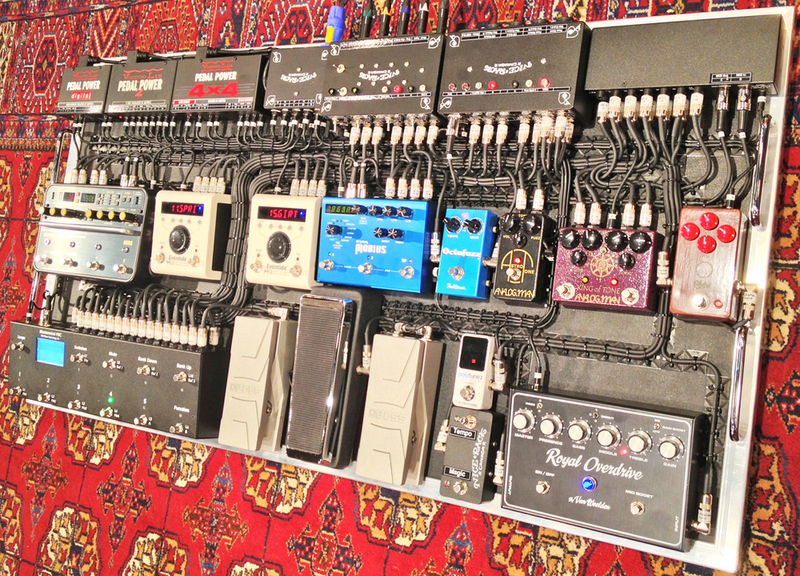 Here's the pedalboard we delivered this week. This system was particularly rewarding & enjoyable to build, beyond specifying the pedals the client wanted to use, our client was kind enough to give us carte blanche to build a system we'd want to call our own. 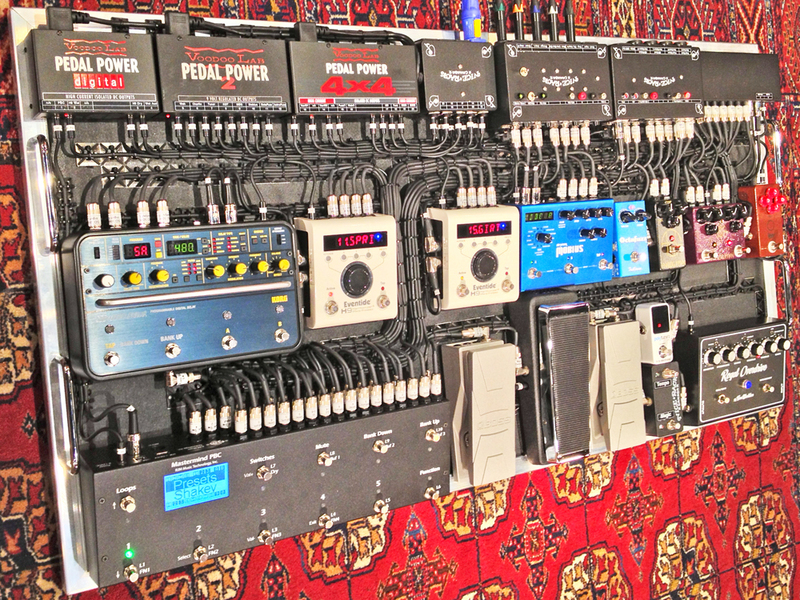 The system is controlled & partially switched by the RJM Music MasterMind PBC, with additional switching support from an RJM Music Mini Effects Gizmo. To accommodate the "here & now" specifics of the system along with "tomorrow & unknown" demands & wishes of the player, we included some unique design features. We included 3 different points in the signal path where a Fuzz pedal, OD pedal or Stereo Modulatons / Delays / Reverbs could be added on the fly with MIDI controllable audio routing and dedicated 9VDC / 400mA taps available. Furthering the flexibility of the system configuration, we built up a custom system mixer that allows the system to be used in a variety of output modes. "Wet / Dry / Wet" or "Wet Mono Amp / Dry Mono Amp" or "Wet / Dry Parallel Stereo" or "Wet / Dry Parallel Mono"
The Eventide H9 & Strymon Mobius both the ability to be wired in Mono, Stereo or Mono Pre & Post Routing. 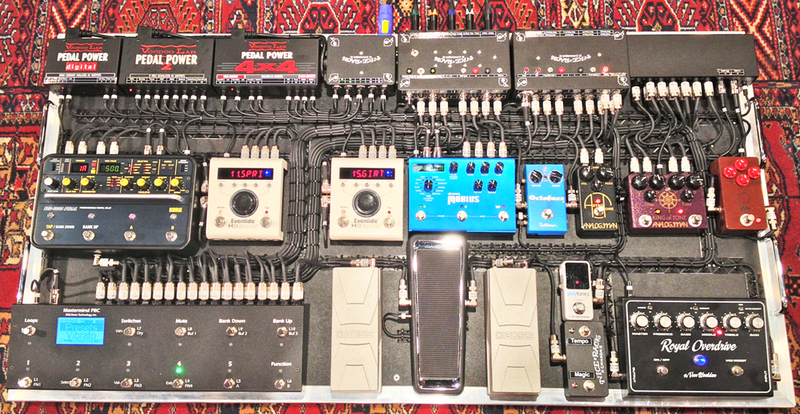 With this in mind the client wanted the ability to put his Fuzzes & OD's before or after the Eventide H9#1 (Comps, Diatonics, Octaver, Whammy, Ring Mod) & the Strymon Mobius (Phaser, UniVibe, Leslie, Vibrato, Chorus, Envelope Filter, Flanger). The output impedance of the Eventide & Strymon pedals is such that placing the particular Fuzzes & ODs the client is using after the H9 & Mobius would result is less than optimal results from the harmonic reach devices. To accommodate this factor we built up a custom buffer with adjustable output impedance, adjustable "make-up" gain & impedance test points to connect a ohm meter. The buffer is connected to the PBC's Loop 3, right after the Eventide & Strymon pedals, right before the first Fuzz pedal. The client's favourite Telecaster has an output impedance of 6.62 kΩ, which is exactly the value we tuned the buffer's output impedance to, thus recreating the impedance that the Fuzzes & OD's are used to seeing from the guitar, while allowing any effect to be placed pre-Harmonics. The entire system & Inserts are powered by the Voodoo Lab Pedal Power Digital, 2+ & 4x4. The Boss FV30H Volume Pedal was gutted of it's PCB with Tuner out and replaced with SwitchCraft Jacks and a Point to Point wiring with no tuner split. The Boss FV30L Volume Pedal was rewired to be a 100kΩ Expression Pedal. We built up an External Switch Box for the PCB with a Globally Assigned Tap Tempo and Per Preset Assigned "Magic" switch that can be uniquely per preset for any momentary or latching switching function not addressed by the MIDI controller. Most often it's used as Fast / Slow / Brake switch for Leslie emulations or infinite repeats in a Delay program. System Design & Fabrication by Nice Rack Canada. Let us design & build your next rack or pedalboard fantasy, it'll be more than you ever imagined to be possible. Tonesmithing Services | Pedalboard & Rack Systems for Guitar, Bass & Keys | Engineered Solutions for Musicians. Last edited by Vegas on Sun Jun 11, 2017 9:29 am, edited 1 time in total. I can only imagine the look on his face when he came in to see that board for the first time! Thanks John, none of this would be possible without you. This is a very nice cabling! I also have a mobius and i'd like to know how did you wire it to be able to use MONO/STEREO and PRE/POST too. Thanks for the kind words about our efforts! With the Mobius, it's either Pre/Post or Stereo, but never both. Yes, i know that both modes doesn't work at the same time. But in this board the user is able to switch between these modes? Sorry I misunderstood your question. No, the user does not switch between modes. The system design was for Pre/Post operation with no intention of making it Stereo. I thought you had made some crazy wiring and switching, so that the user would be able to switch between PRE/POST and STEREO. It would be really nice. I'm building a rack for my gear and i have some empty loops. I'm trying to find some way to make it.